10. Harness the powerHands up who has ever found themselves crouched on the floor, fumbling to plug a cord into a power point positioned mere millimetres above the carpet. In some rooms it’s smart to locate power points close to the floor, but the home office can be an exception. Why? Because when we work, we plug and unplug our phone, computer and tablet chargers with a similar frequency to when we cook using kitchen appliances (and we all know that power points in the kitchen are more accessible at bench height). So save your spine and position your power points within arm’s reach. 16. Location: New York, USAFeatures: Every kitchen should have a charging drawer – no more unsightly cables. 7. 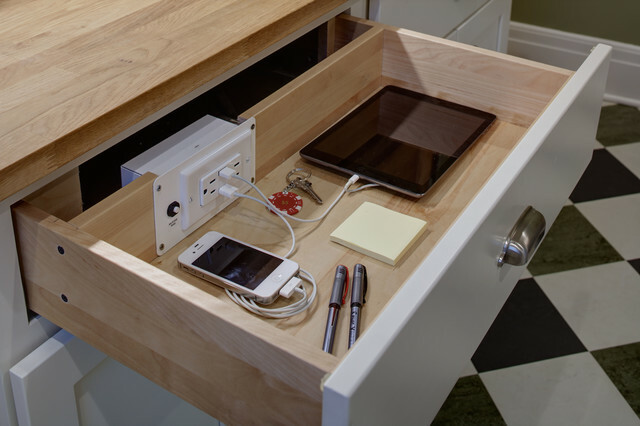 Location: New York, USAFeatures: Every kitchen should have a charging drawer – no more unsightly cables.